Last month we saw a lot of people 3D printing the hairy lion. 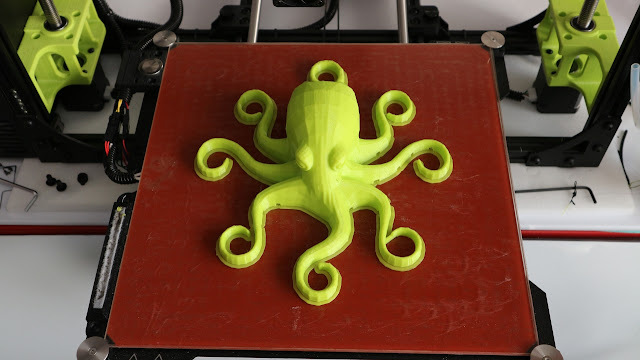 That inspired me to design a complex looking tool holder, but with an easy way to 3D print out the model and some easy re-shaping of the tentacles after printing (using hot air for thermoforming). 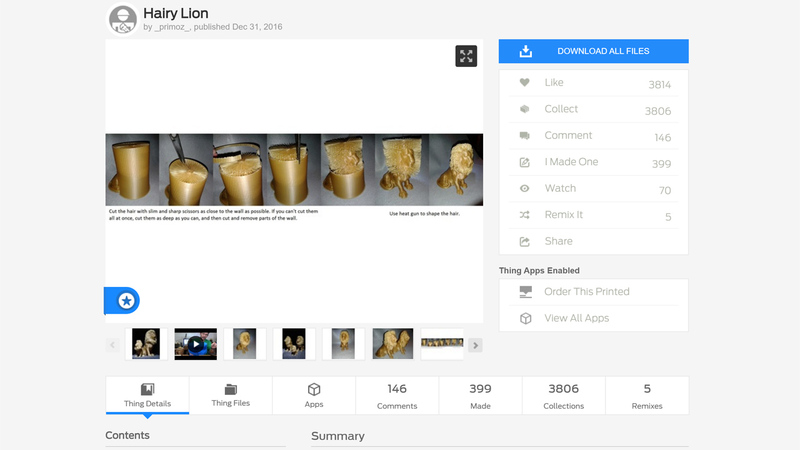 The hairy lion is a good example of re-forming thermoplastic into a different shape after first printing in a much easier model, that's more optimised for the 3D printing process. The model is printed out flat. It's easy to both model and 3D print this way. 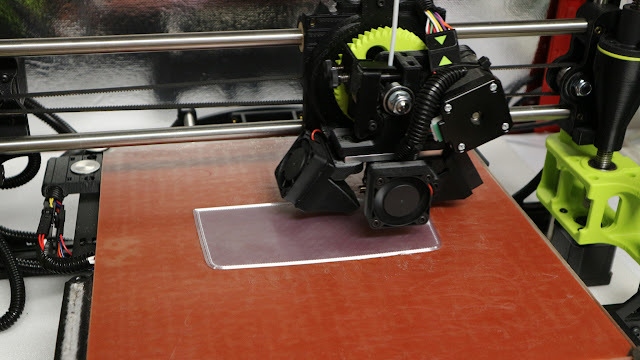 After printing, shape the legs into interesting positions by using a heat-gun. 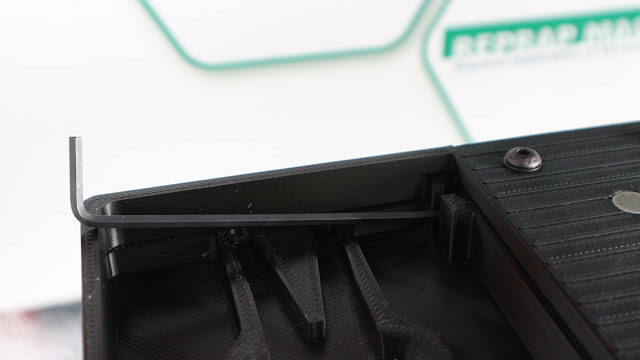 This is Colorfabb nGen material, great for thermoforming. 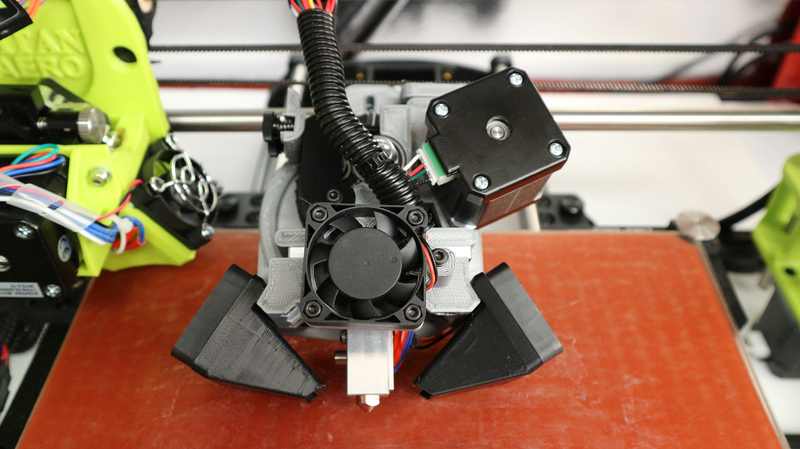 PLA is also very easy to form using hot-air or hot water. The metal plate shown above is simply being used as a heat shield so the tentacles bend exactly where I want them and the body is not deformed. 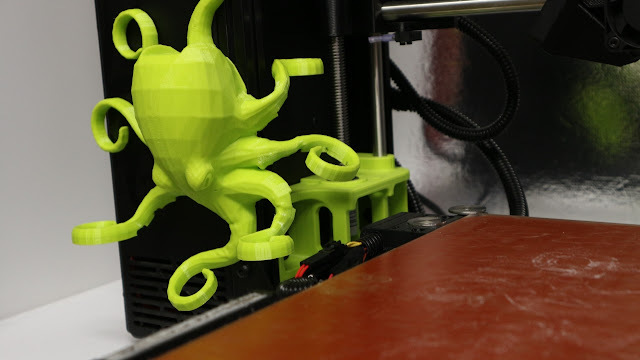 You may need to do a little more bending once fitted to make sure tentacles are not in the way of the 3D printer moving parts. 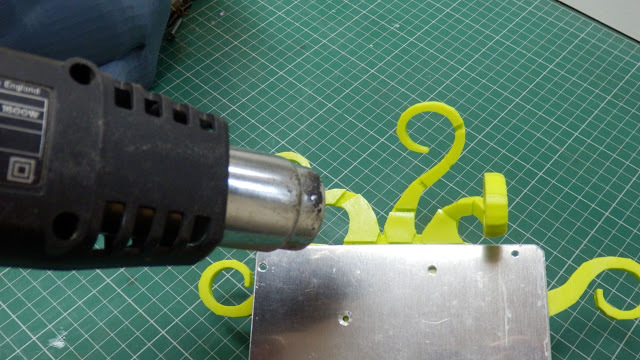 A 3D printed clip allows you to slide the Octo-Tool holder onto the machine. 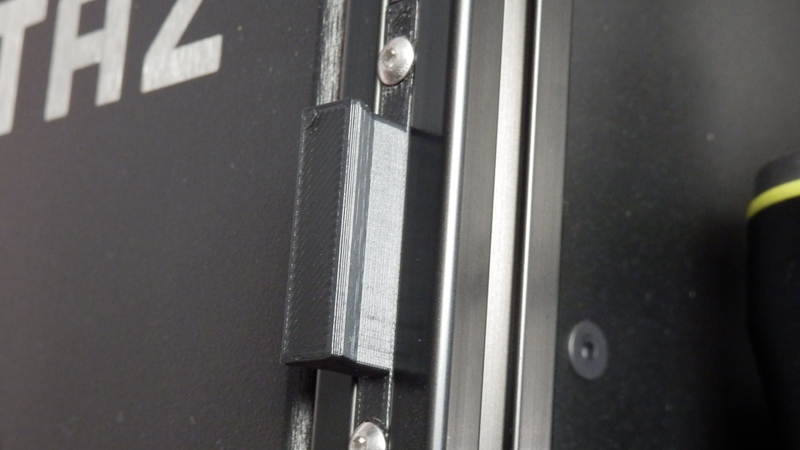 You just need to slot the clip into the TAZ 6 20mm aluminium t-slot section on the left hand side. You could add many other tools and upgrades to your machine this way. You will need to remove one part of the TAZ 6, just to allow the clip to slot in. Be careful not to loose the t-slot nuts, they do enjoy slipping down the aluminium channel sections. Use blue-tack to hold them in place. 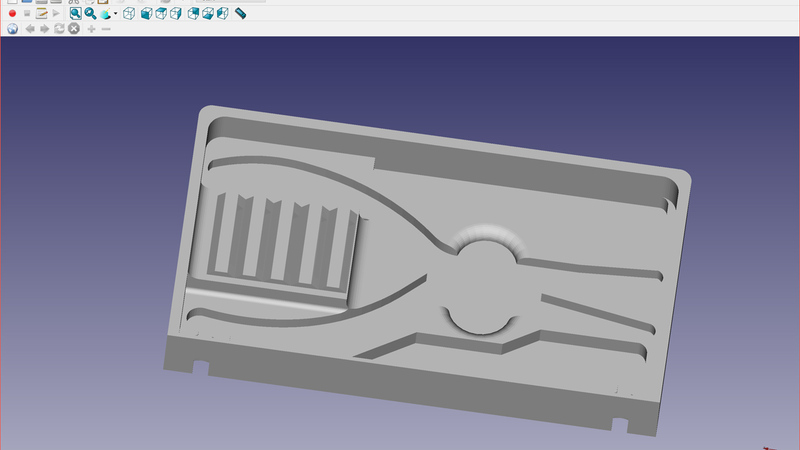 The top tool holder can also be printed and fitted, if you would like to have a different top tool holder, then feel free to alter the Freecad model included with the Youmagine link below. It can be fitted using the existing bolts, just loosen then a little and slot in the top tool holder. 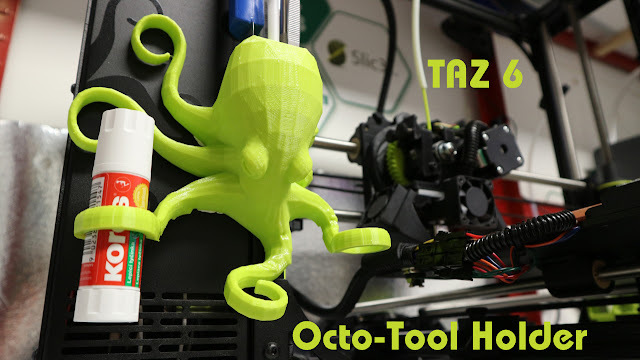 Add tools and SD cards, and you are all set with even more awesome TAZ 6 3D Printer. 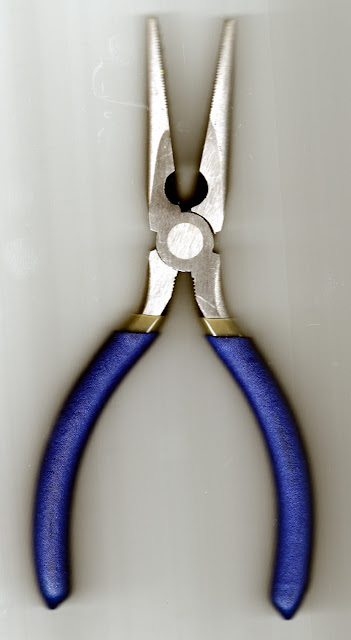 One tip I didn't talk about in the video above is an easy way to make shapes for tools like the Pliers. 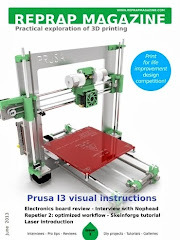 I have used this method many times and it's a great way to ensure existing objects fir into 3D printed parts. Take a 2D scan or a good photo, or the object. Then just load (import) this image into your CAD program and scale to a known dimension of the object. For this set of pliers, I measured the distance of the middle round section and scaled the image so that dimension was correct. then you know you are at the correct scale for the model. It's then just a case of tracing around the image and producing a plane you can extrude, to form an indent for the object. You can round corners and add grip points as I did in the top tool holder. I have replaced all manner of objects using this method, from shower mounts to kitchen utensils, just from simple 2D scans using a flat-bed scanner. I hope that was useful, do comment and please subscribe to my YouTube channel for more 3D printing adventures soon. LulzBot TAZ 6 Testing Part 2 - Problems, Printing, Materials and Tuning to perfection. For this second part of the TAZ6 setup I'm looking at some initial issues found with the setup and operation of the TAZ6. These were quickly resolved, but showing you the process may assist if you have similar problems on your 3D printer. I was also sent a MOARstruder by the LulzBot team, I talk about it in the video along with a custom tool-head I have made for the TAZ 5/6 using the E3D Titan AERO extruder+hot-end. 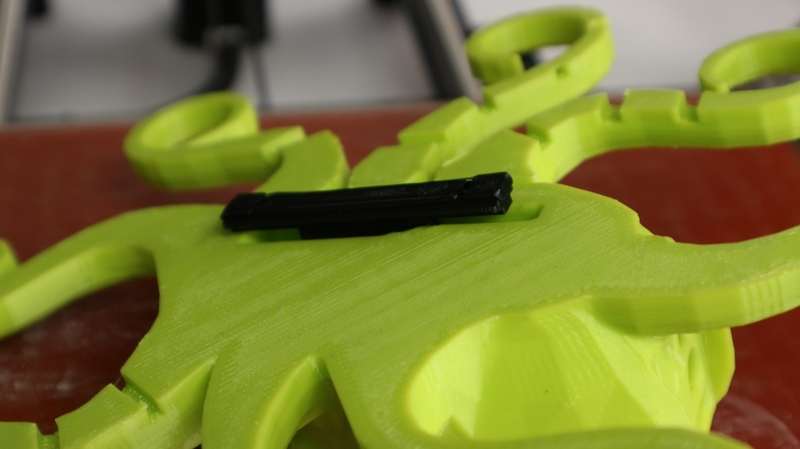 Further details about the MOARstruder can be found here, on the LulzBot Website. The MOARstruder has a 'Volcano' compatible 1.2mm nozzle and long heating block for 100g+/hour deposition rates. I'll post a separate blog and video about the Titan AERO extruder mount for the TAZ6, I'll also post the files if you wish to try to out too. The Titan AERO saves around 178 grams in weight over the original Hexagon tool head, so you can fling it around faster too. 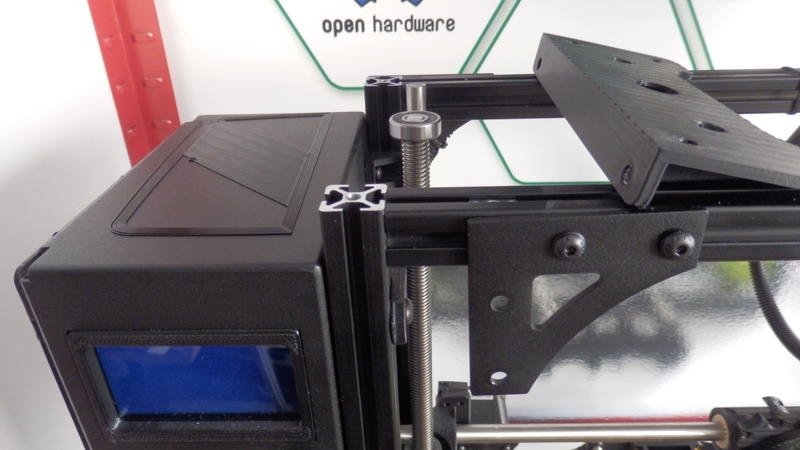 Further details about the E3D Titan AERO extruder and hot-end system can be found here, on the E3D Website. The Video below is also over on YouTube if you wish to watch in HD and also subscribe to my channel for more videos, help and advice. 00:50 - I have a MOARstruder !!! 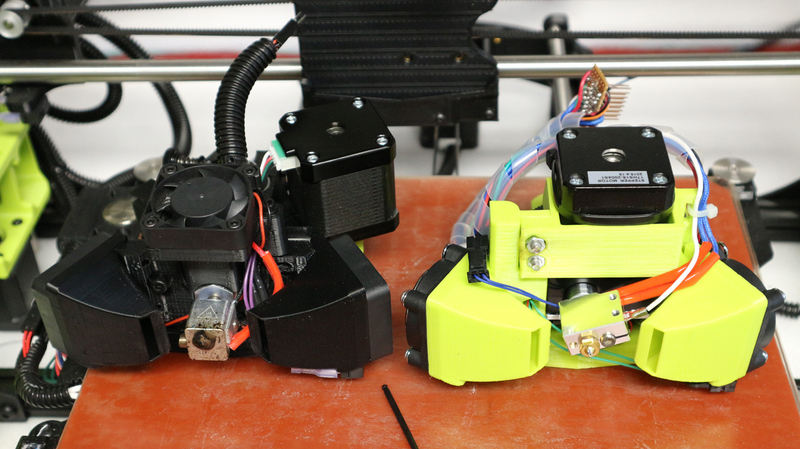 I will post an update on the print progress with both the MOARstruder and the Titan AERO on the TAZ6. I'll also tidy up and share my firmware setting changes and print profiles I'm now using for TAZ6 printing. I initially started with PLA, then nGen and PETT (t-glase). I still have Nylon, flexible and composite profiles to generate and test. I had one initial problem with the SD card reader built into the TAZ6. The SD card was not being recognized on the LCD display as being inserted. First I thought that the SD card may just have been blank or faulty, but after checking it had some contents and was formatted correctly I investigated further. This cable for the SD-Card connector had fallen off - I'm guessing during transport. After opening up the side panel housing the power supply and the main electronics control board, I soon spotted that a cable was hanging in mid-air over the main RAMBo control board. 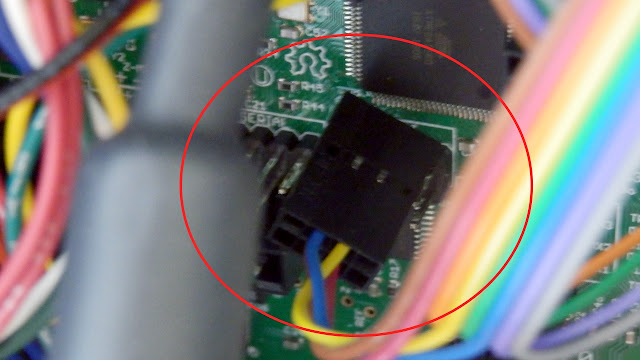 When checking this was easily identified as the main serial connection to the SD card mounted on the user interface LCD display board. Only 4 pins of this 8 way connector are being used, that's not a great deal of friction to lock this connector in place. If you look at the connector in the bottom right, you can see that spare unused pins have been fitted into the 8 way connector. Adding these unused but fitted pins adds more friction and helps to lock the connector onto the mating pins. Especially important on this cable as only two pins are connected. 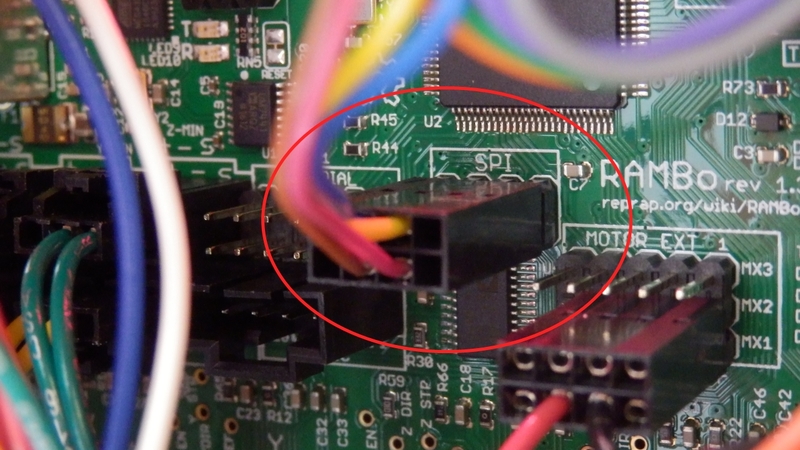 A much better solution is to for positive locking connectors to the RAMBo electronics board. I checked the correct orientation and connected the cable back onto the RAMBo board. this resolved the SD card reading problem, and allowed me to get started on a test print that's included on the supplied SD card. This was a simple problem and a simple fix, but for anyone without the confidence or desire to open up the TAZ6 it may have been only fixed by returning the machine to the supplier or manufacturer. This cable and a few others used on the RAMBo are not 'positively locking', this means that they could fall out with a sudden jolt or unfortunate movement of cables. 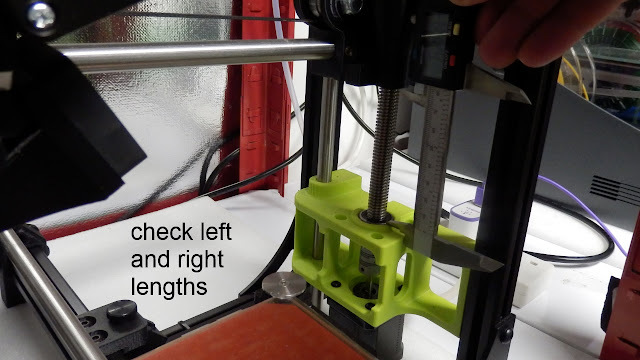 In this case it was probably during transportation as LulzBot would have checked (and indeed they supply a printed check-sheet of machine functions) that the SD card interface was working before leaving the factory. This connector for the SD card also only has a few connections fitted, this means that it has quite low friction and is even more likely to fall out. 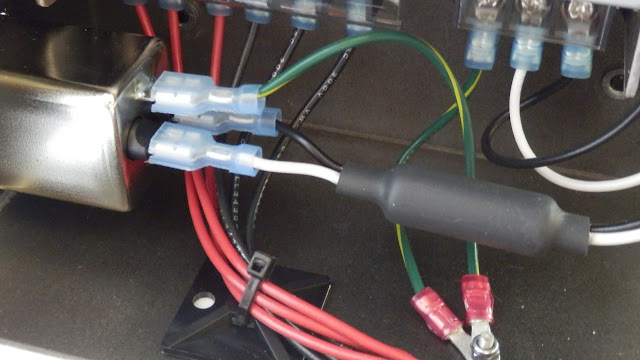 Over the last 25 years as an electronics engineer I have seen a number of ways to combat this problem, you can simply add more crimps into the spare unused pin positions as a way to increase connection force (friction) as seen above. But the best way is to use locking connectors on the electronics board. The basic box header connections usually fitted to RAMBo (and other 3D printer electronics) are very low cost and used everywhere. 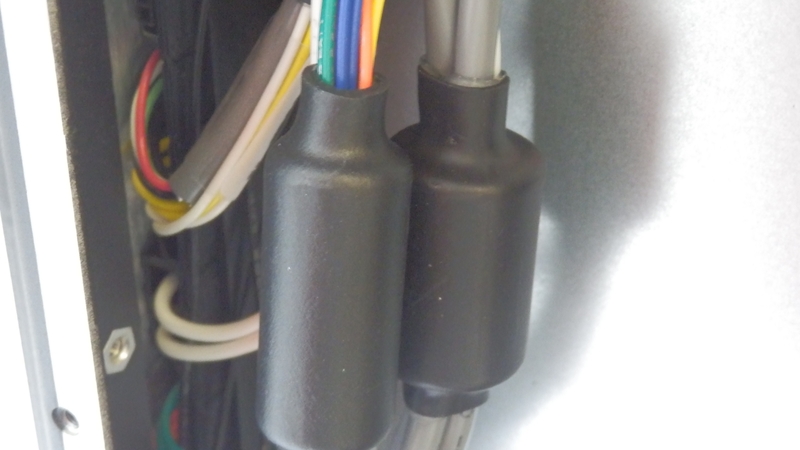 You can get compatible shrouded box connections that incorporate both polarizing features - to ensure the connector is not connected in reverse or off-set and also a plastic locking clip that will keep the connector mated until you want it to be removed. They would be a drop-in replacement, so would not require any changes other than a different supplier on the electronics bill of materials. 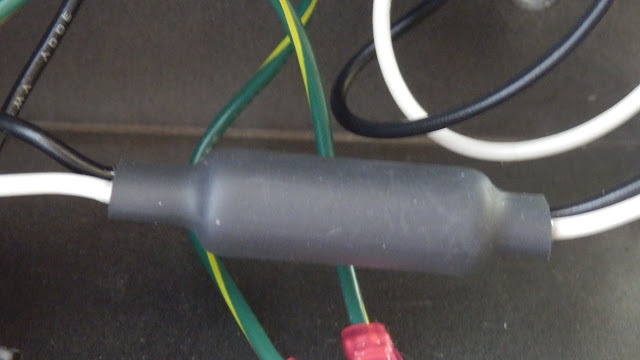 One other nasty way is to add a drop of hot-melt glue or silicone to physically 'lock' the connector cable to the board, but that's really not a good solution. In my view, changes to this and some of the other connections ( housings and mating cables) on the RAMBo board would significantly reduce the chance of cables becoming accidentally dislodged in use or transit. I would be interested in knowing if anyone has had a similar issue with this or any other electronics that do not use positive locking connectors (comment below if you have or have an opinion on this issue). On the plus side the wiring inside the electronics box is tidy and many attempts have been made to improve the safety factor for anyone opening up this machine. Mains voltages are well routed with correct terminals crimped and fitted so minimal exposure to live parts are exposed. 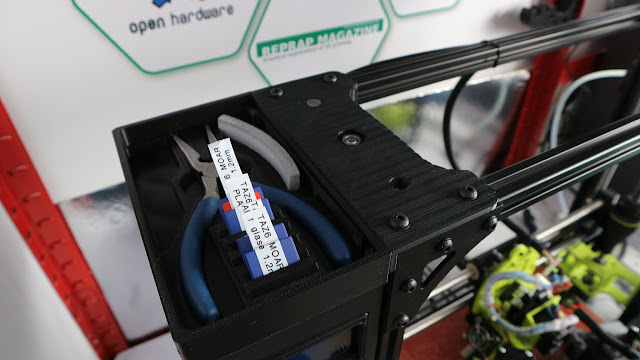 Obviously make 100% sure the mains power input is removed and disconnected before you open up any 3D Printer or any other device for that matter. The power supply is also CE marked as is the entire machine. Along with both European and American EMC testing standards. As well as a CE mark and electrical safety, it's obvious that this machine has also gone through EMC and electrical standards for operation and interference. That's a really good thing and something that we still do not see on many other 3D printers sold as kits and fully assembled machines. The round grey ferrite filters shown in the images below, are wrapped around various cables. This indicates that during machine testing of EMC and EMI areas were identified that needed some suppression of electrical noise. The mains input filter (metal can in left side of image above) also helps to reduce conducted emissions back down into the mains of your house (and other people's houses). Usually long cables like motor connections for example will act like ariel's attached to the electronics, these can radiate electrical noise and can also pick up radiated electrical noise from other equipment around you. Adding a ferrite clamp can often reduce these problems and allow EMC approval of a machine like a 3D printer. Seeing these indications of a well designed, carefully assembled and correctly tested product makes me very happy. It's something many users don't even think about, but when you have a product with heating components, high currents and moving cables, I would strongly urge you to ask the questions - Has the machine you are considering been both safety tested and passed relevant electronic approval standards for your country? If your 3D printer uses mesh bed levelling (it takes a number of probe point measurements across the bed and uses this to compensate for an incorrectly levelled surface) - Then do spend some time trying to get the bed manually as level as possible. Why? - Basically because when the hot-end moves around the build area it has to constantly raise and lower the Z axis. The Z axis is the slowest linear movement on your 3D printer. 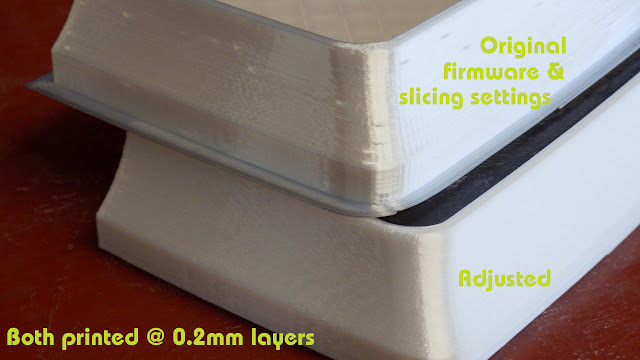 Having a poorly setup bed is also more likely to cause print issues like blobs or strings if you are doing long travel moves, where the mesh levelling compensation is adjusting for +/- >0.5mm of uneven surface. 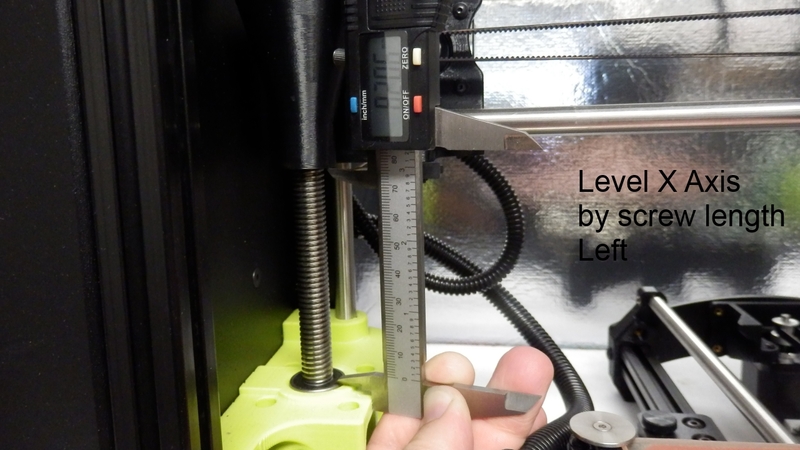 The LulzBot team measure the lengths from the X axis bars to the top, and that's a much better way for the TAZ6 3D Printer. For many 3D printers using mesh bed leveling you can measure each side of the Z axis, and manually turn each lead-screw so they are the same (Again, do check how to do this correctly for the TAZ6, see above). The most important thing is that the nozzle is at a level and flat point across the entire build surface, so if the left and right lead-screw are at different positions, then that's fine. Then check if that has actually made the nozzle distance the same on each side of the build surface. If not, then adjust so wherever you manually move/place the nozzle (move X / Y carriages) it has a similar distance from the build surface (+/- <0.2mm if possible). You will get better results if you do this, and you can then also start to tune the firmware to reach higher operating speeds and smoother print results. I'll go over my TAZ 6 Firmware changes in a future video. First layer of the shelf model - It's perfect. Top part in the image above was printed with the original TAZ6 firmware settings and default Cura profiles for TAZ 6 PLA. The lower model was printed at the same layer height, same infill and same number of perimeters. The difference was a few firmware changes and revised profile settings. 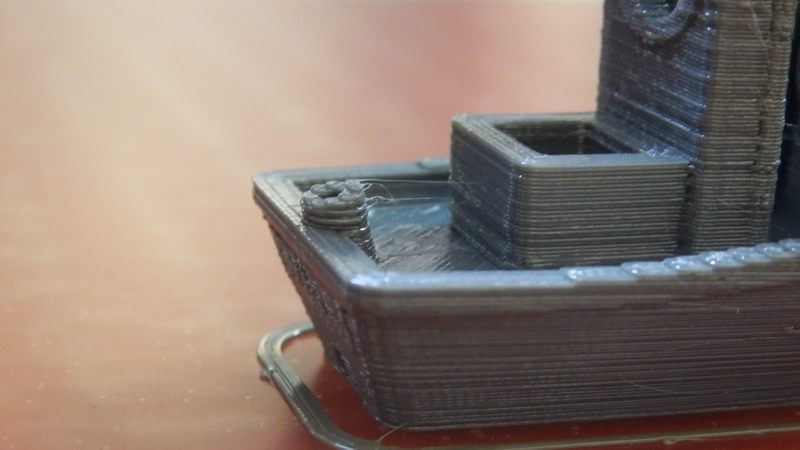 The bottom model also printed around 20% quicker than the original setup. I use Polyalchemy Elixir PLA to test print quality, it will show up the smallest flaw in printing settings, so it's great to refine your profiles and acceleration settings. I'll show more examples of these changes with printed models in the next TAZ 6 video. Before I made the firmware and profile changes, I did print out the samples Gcode models on the supplied SD Card. They show up some print issues, but they can all be resolved with setting changes. 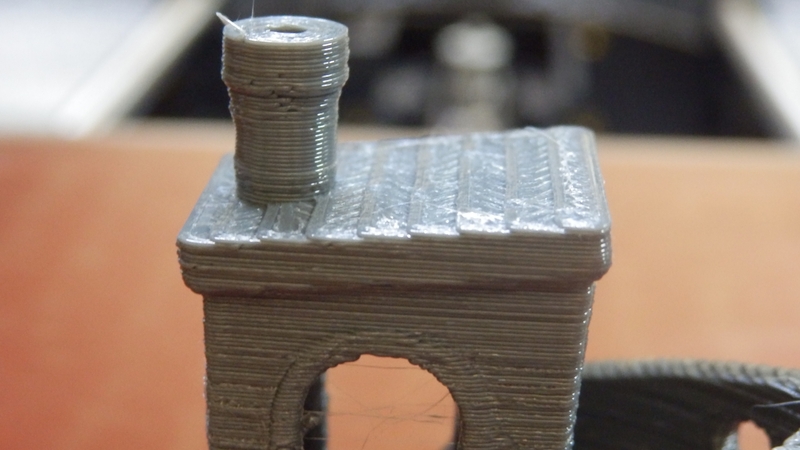 Printed in Colorfabb nGen (light grey because it shows up defects well to the camera). You can see some missing perimeter sections in the top of the funnel above. 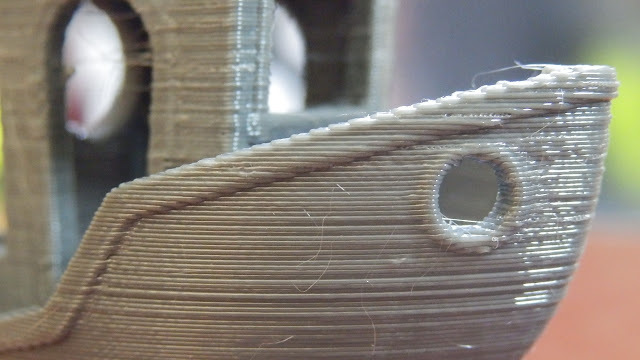 We also have a few blobs and retraction strings, all of these problems can be resolved. And when they are the TAZ 6 becomes a stunning 3D Printer. I'll continue to add more video's and blog posts about the TAZ 6 adventure as they get completed. Please leave comments and feedback below. 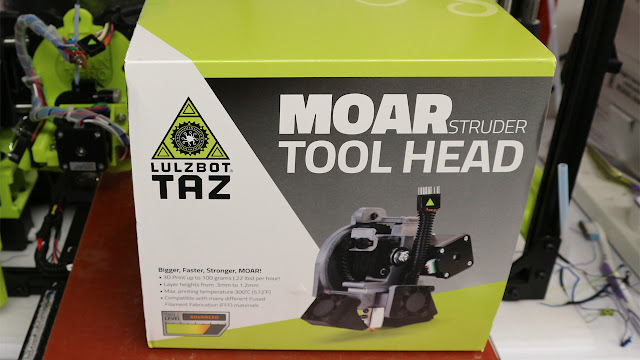 And I'm really interested in also hearing from any existing LulzBot TAZ owners. I hope this was useful, thank you for reading & watching, see you next time.